The Navy commissioned its newest Freedom-variant Littoral Combat Ship (LCS), USS Sioux City (LCS-11), during a 9 a.m. ceremony Saturday, November 17, at the United States Naval Academy in Annapolis, Maryland. U.S. Senator Joni Ernst of Iowa delivered the commissioning ceremony’s principal address. Mary Winnefeld, the wife of former vice chairman of the Joint Chiefs of Staff, retired Admiral James «Sandy» Winnefeld, was the ship’s sponsor. The ceremony was highlighted by a time-honored Navy tradition when Mrs. Winnefeld gives the first order to «man our ship and bring her to life»! «This ship is named in honor of Sioux City, Iowa, but represents more than one city», said Secretary of the Navy Richard V. Spencer. «USS Sioux City (LCS-11) represents an investment in readiness and lethality, and is a testament to the increased capabilities made possible by a true partnership between the Department of the Navy and our industrial base». The future USS Sioux City, designated LCS-11, is the 13th LCS to enter the fleet and the sixth of the Freedom-variant design. The future USS Sioux City is the first naval vessel to be named in honor of Sioux City, Iowa. The fourth-largest city in the state, Sioux City was founded in 1854 at the navigational head of the Missouri River and takes its name from one of a group of North American Indian tribes that make up the Great Sioux Nation. The littoral combat ship is a fast, agile, mission-focused platform designed to operate in near-shore environments, while capable of open-ocean tasking and winning against 21st-century coastal threats such as submarines, mines and swarming small craft. They are capable of supporting forward presence, maritime security, sea control and deterrence. USS Sioux City (LCS-11) will be homeported at Naval Station Mayport, Florida. The U.S. Navy accepted delivery of two Littoral Combat Ships (LCSs), the future USS Sioux City (LCS-11) and USS Wichita (LCS-13), during a ceremony at the Fincantieri Marinette Marine shipyard on August 22. Sioux City and Wichita, respectively, are the 14th and 15th Littoral Combat Ships (LCSs) to be delivered to the U.S. Navy and the sixth and seventh of the Freedom variant to join the fleet. These deliveries mark the official transfer of the ships from the shipbuilder, part of a Lockheed Martin-led team, to the U.S. Navy. It is the final milestone prior to commissioning. Both ships will be commissioned later this year, USS Sioux City (LCS-11) in Annapolis, Maryland, and USS Wichita (LCS-13) in Jacksonville, Florida. 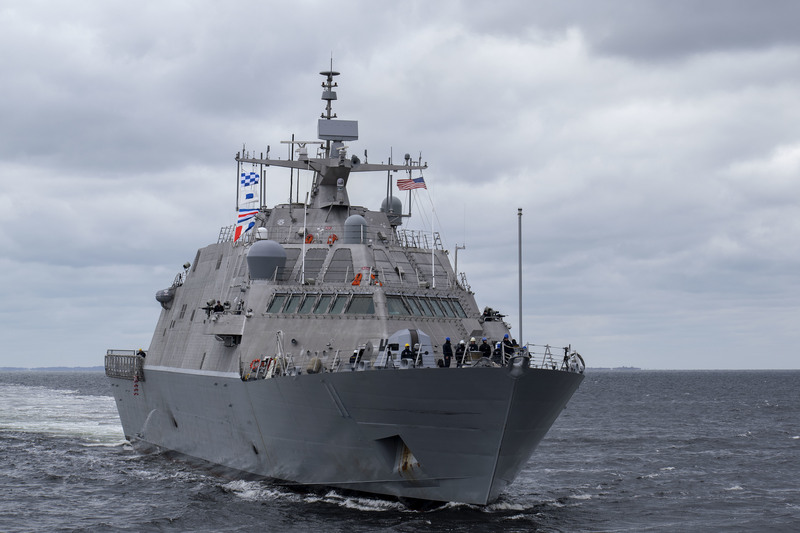 Regarding the LCS deliveries, Captain Mike Taylor, LCS program manager, said, «The future USS Sioux City (LCS-11) is a remarkable ship which will bring tremendous capability to the Fleet. I am excited to join with her crew and celebrate her upcoming commissioning at the home of the U.S. Naval Academy in Annapolis». «Today also marks a significant milestone in the life of the future USS Wichita (LCS-13), an exceptional ship which will conduct operations around the globe», he said. «I look forward to seeing Wichita join her sister ships this winter». Captain Shawn Johnston, commander, LCS Squadron Two, welcomed the ships to the fleet, saying, «The future USS Sioux City (LCS-11) is a welcome addition to the East Coast Surface Warfare Division. Both her Blue and Gold crews are ready to put this ship though her paces and prepare the ship to deploy». «The future USS Wichita (LCS-13) is the first East Coast Mine Warfare Division ship», he said. «She will have a chance to test some of the latest and greatest mine warfare systems after she completes her remaining combat systems trials». Several additional Freedom variant ships are under construction at Fincantieri Marinette Marine. The future USS Billings (LCS-15) is preparing for trials in spring 2019. 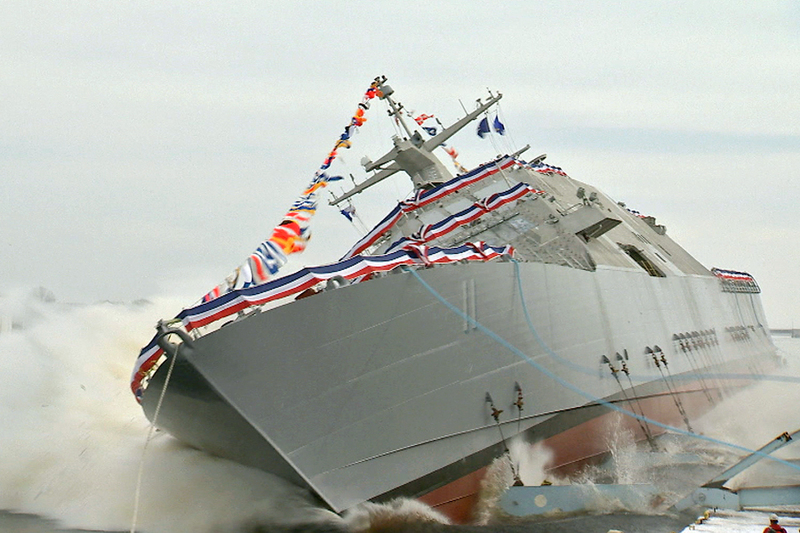 The future USS Indianapolis (LCS-17) was christened/launched in April. The future USS St. Louis (LCS-19) is scheduled for christening and launch in the fall. The future USS Minneapolis-Saint Paul (LCS-21) is preparing for launch and christening in spring of 2019, while the future USS Cooperstown (LCS-23)’s keel was laid earlier this month and is undergoing construction in the shipyard’s erection bays. The future USS Marinette (LCS-25) started fabrication in February, while the future USS Nantucket (LCS-27) is scheduled to begin fabrication in the fall. LCS is a modular, reconfigurable ship designed to meet validated fleet requirements for surface warfare, anti-submarine warfare and mine countermeasures missions in the littoral region. An interchangeable mission package is embarked on each LCS and provides the primary mission systems in one of these warfare areas. 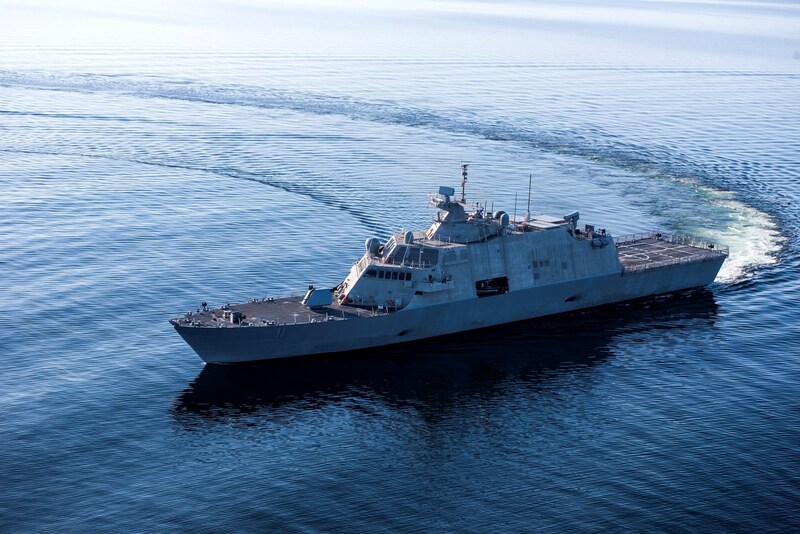 Using an open architecture design, modular weapons, sensor systems and a variety of manned and unmanned vehicles to gain, sustain and exploit littoral maritime supremacy, LCS provides U.S. joint force access to critical theaters. The LCS class consists of the Freedom variant and Independence variant, designed and built by two industry teams. The Freedom variant team is led by Lockheed Martin (for the odd-numbered hulls, e.g., LCS-1). The Independence variant team is led by Austal USA (for LCS-6 and follow-on even-numbered hulls). Twenty-nine LCSs have been awarded to date, with 15 delivered to the U.S. Navy, 11 in various stages of construction and three in pre-production states. Program Executive Office for Unmanned and Small Combatants is responsible for delivering and sustaining littoral mission capabilities to the fleet. Delivering high-quality warfighting assets while balancing affordability and capability is key to supporting the nation’s maritime strategy. Littoral Combat Ship (LCS) 11, the future USS Sioux City (LCS-11), completed Acceptance Trials in the waters of Lake Michigan. LCS-11 is the sixth Freedom-variant LCS designed and built by the Lockheed Martin-led industry team and is slated for delivery to the U.S. Navy later this summer. «LCS-11’s completion of Acceptance Trials means this ship is one step closer to joining the fleet and conducting critical maritime operations for the Navy», said Joe DePietro, vice president, Small Combatants and Ship Systems at Lockheed Martin. «This ship is agile, powerful and lethal, and the industry team and I are looking forward to her delivery, commissioning and deployment». The trials, conducted May 20-24, included surface and air detect-to-engage demonstrations of the ship’s combat system. Major systems and features were demonstrated, including aviation support, small boat launch handling and recovery and ride control. «I am extremely proud of our LCS team including our shipbuilders at Fincantieri Marinette Marine», said Jan Allman, Fincantieri Marinette Marine President and CEO. «These are complex vessels, and it takes a strong team effort to design, build and test these American warships». The future USS Sioux City (LCS-11) is one of eight ships in various stages of production and test at Fincantieri Marinette Marine, with one more in long-lead production. The next Freedom-variant in the class is LCS-13, the future USS Wichita. LCS-13 is slated to complete Acceptance Trials in early summer with delivery this year. Lockheed Martin’s Freedom-variant LCS is a highly maneuverable, lethal and adaptable ship, designed to support focused-missions in the areas of mine countermeasures, anti-submarine warfare and surface warfare. The Freedom-variant LCS integrates new technology and capability to affordably support current and future mission capability from deep water to the littorals. LCS11AT_Social from RMS Videography on Vimeo. 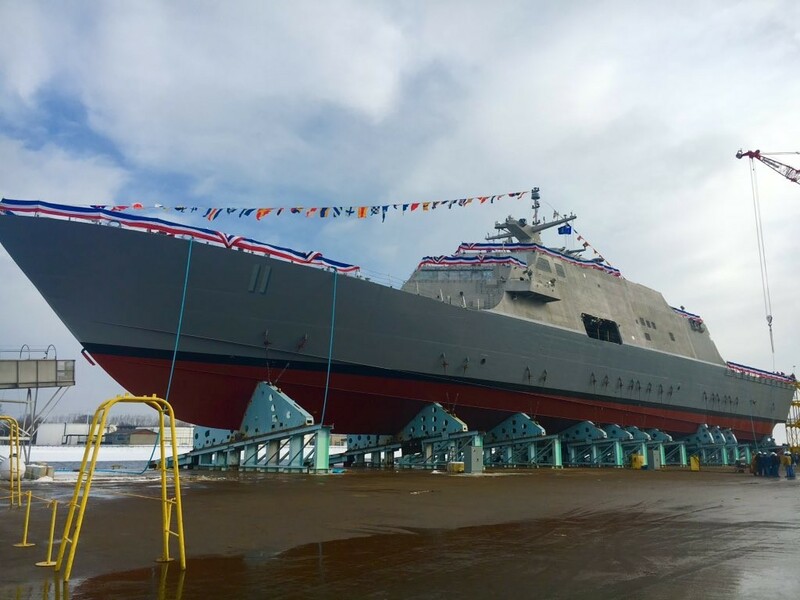 The Lockheed Martin-led industry team launched the nation’s 11th Littoral Combat Ship (LCS), Sioux City, into the Menominee River at the Fincantieri Marinette Marine (FMM) shipyard on January 30. 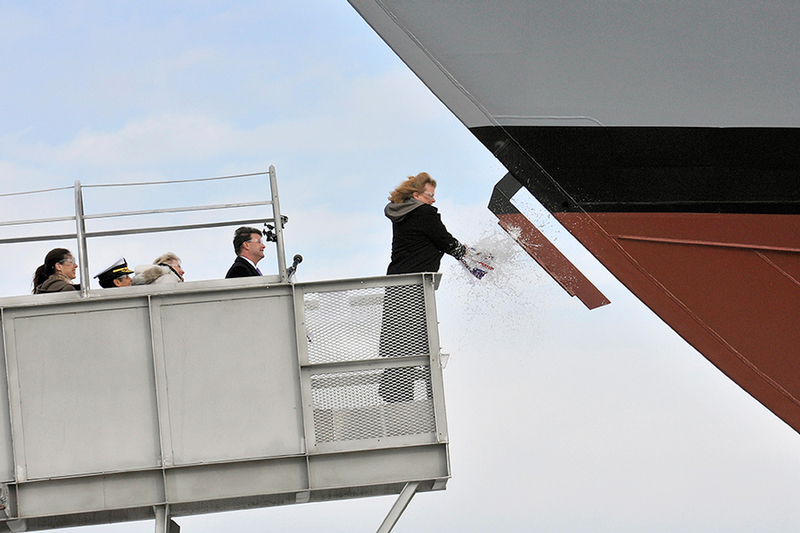 The ship’s sponsor, Mrs. Mary Winnefeld, christened the USS Sioux City (LCS-11) with the traditional smashing of a champagne bottle across the ship’s bow just prior to the launch. «It is an honor and a privilege to serve as the sponsor of the future USS Sioux City (LCS-11) and to be a part of this major milestone along the way to her assuming her place as part of the great U.S. Navy fleet», said Mrs. Winnefeld. «I also look forward to an ongoing relationship with her courageous crews and their families throughout the ship’s lifetime». Following christening and launch, USS Sioux City (LCS-11) will continue to undergo outfitting and testing before delivery to the U.S. Navy in early 2017. «The future USS Sioux City’s interchangeable mission modules will empower her to face a variety of high-priority missions, from Anti-Surface Warfare (ASuW) to Anti-Submarine Warfare (ASW) to Mine CounterMeasures (MCM)», said Joe North, Lockheed Martin vice president of Littoral Ships & Systems. «She is ideally suited to navigate the reefs and shallows in the Asia-Pacific, as USS Fort Worth (LCS-3) has demonstrated on her current 20-month deployment». The Freedom-variant ships have demonstrated their value with successful deployments to Southeast Asia, including USS Fort Worth (LCS-3), which is providing the necessary capabilities for contingency operations in the region today. USS Freedom (LCS-1) conducted a successful deployment to Southeast Asia in 2013 and is currently operating out of her homeport in San Diego. «The Christening and Launch of the USS Sioux City (LCS-11) is a proud event for FMM», said Jan Allman, President and CEO of Fincantieri Marinette Marine. «It showcases the craftsmanship and engineering capabilities of our workforce. We are confident that this ship will play a vital role in the Fleet, and carry the spirit of our industry team as she sails the globe». The Lockheed Martin-led industry team is currently in serial production of the Freedom-variant, and has already delivered three ships to the U.S. Navy to date. 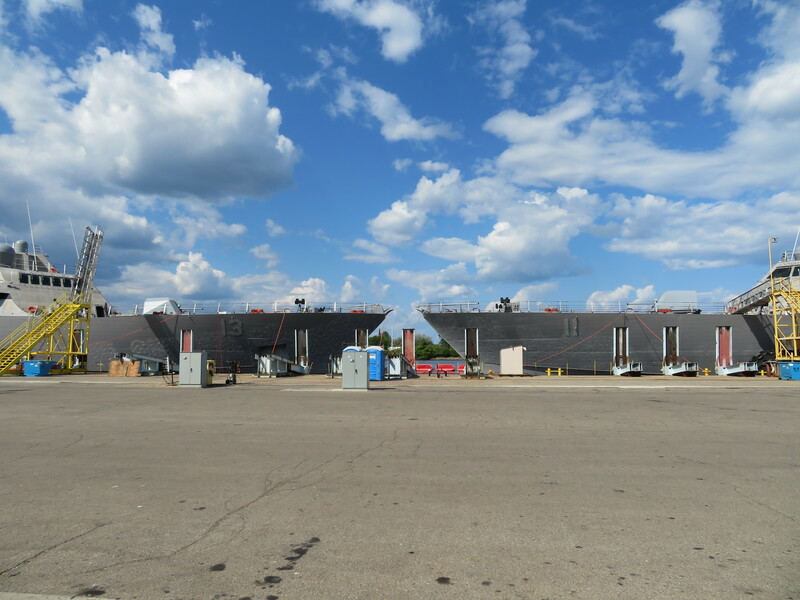 The USS Sioux City (LCS-11) is one of seven ships in various stages of construction at Fincantieri Marinette Marine, with two more in long-lead production.